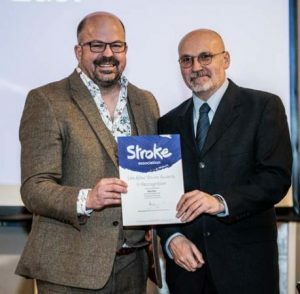 We are delighted to announce that our very own member of staff Alan Parr (pictured on the right) has received a recognition certificate from The Stroke Association after his mammoth charity event last year. Alan decided to embark on a charity Kick-Scooter event on his own, travelling from his parents home in Leigh in Lancashire to Lee-On-Solent in the South. Alan chose The Stroke Association as his chosen charity as both his parents and one of his work colleagues have been affected by a stroke. Alan completed the journey which was self funded, in 5 days and completed 284.64 miles. His Kick-Scooter was equipped with the basics for this physically demanding journey. Alan even carried a tent for over his overnight stops to keep his expenditure to a minimum. His journey wasn't an easy task. Alan had to endure torrential rain and even suffered three punctures in one day.